Windpower Workshop is a textbook of small wind turbine secrets with the minimum of mathematics, based on my own experiences of applying the theory to the reality. New edition in 2011 – 154 pages. A book dedicated to building your own working windmill for electricity production. Details of generator choice and design, blade construction, furling systems, towers, wiring, battery charging, heating, alternator design, modifications for car alternators and generators, and everything else you will need to know. 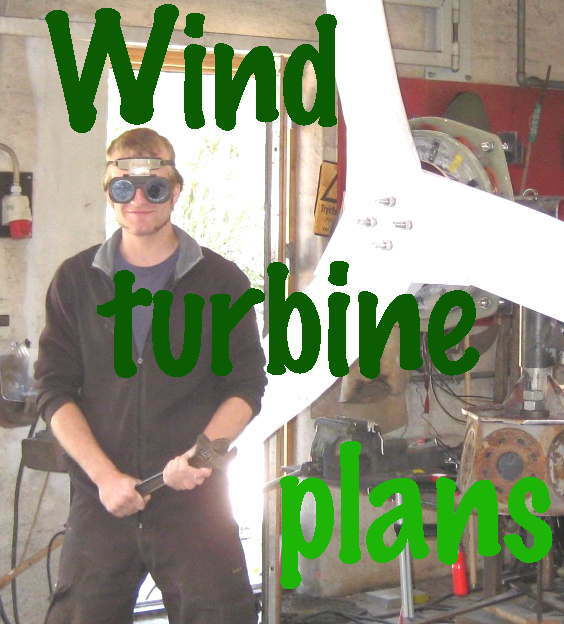 This is a book about, rather than specific instructions for building your turbine. It works well in conjunction with my Recipe Book, providing more insight and dealing in more depth with installation and system design. “With great interest, I have gone through the entire book within two days. I must assert that your book is the most practical and most valuable for those who want to manufacture small wind turbines. In very short, you have explained theory and practice both really vividly. Your approach of explaining the subject is really penetrating to the brain and it is highly commendable. Even a layman can understand the subject very clearly. I am sure that your book will play very important and effective role in disseminating small wind technology throughout the world. I convey my hearty feelings and many many congratulations for writing this most valuable book. 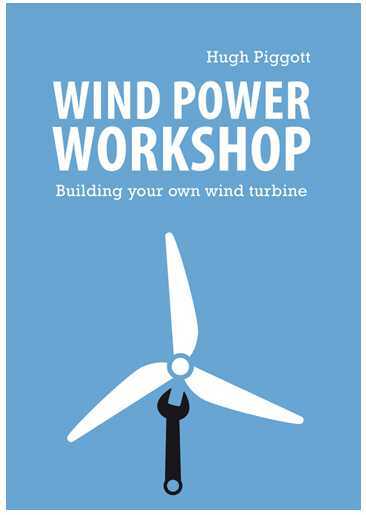 I must admit that I have never come across such a nice and practical book as WIND POWER WORKSHOP. All the 8 chapters are very nice. How much power can you expect? Efficiency: where does the energy go? Reviewer: Bruce Boatner from Murrieta, CA USA This book contains real practicality, not just empty theory. Talk about “put your money where your mouth is” – Hugh lives on a remote spit of land in Northern Scotland that doesn’t even have roads, much less access to the power grid. If necessity is the mother of invention, there’s good reason why he was highly motivated to develop the kinds of simple airfoils and low speed alternator combinations that produced real power. This rudimentary experience has taken him all over the world for installations and workshops. I guess having someone like that around makes him a pretty popular guy with his neighbors. This book covers the theory necessary to understand wind energy basics, and proceeds as a how-to manual on shaping a simple turbine out of wood. It then shows how to build a low speed alternator out of a brake drum. (There is another book by Hugh called “Brake Drum Windmill Handbook” which goes into more detail). The challenge is building an electrical generating system that operates at the slow rotational speeds of a wind turbine (e.g. 300 – 500 RPM). Everybody wants to hook up an automobile alternator, but even if it is optimized for high output at an idle, it probably will not start producing power until it reaches 1800 RPM. (Typically the engine/alternator pulleys have a ratio of 3 or 3.5 to 1 and the engine idles @ 600 RPM). Windpower Workshop is a 1997 release in the Centre for Alternative Technology’s series Anglicizing small wind turbine publications for a British audience. For more than twenty years CAT has been demonstrating the use of alternative technology from water power to wind turbines at their center in an abandoned slate quarry in central Wales. Windpower Workshop grew out of Hugh’s lectures at CAT instructing people on how they can build their own low-cost wind machines. Hugh’s book is a distillation of more than two decades of windpower experience most of it off-the-grid on a remote windswept peninsula in far northwestern Scotland. Many of the homes, schools, and workshops in the vicinity use windpower and Hugh has either built the turbines himself or services them. Denizens of the electronic news group “awea.wind.home” will recognize some of Hugh’s postings. One familiar discourse is his enlightening discussion of furling and furling pivot design and how this affects a turbine’s performance. Some American manufacturers of small wind turbines would be well advised to read this section carefully. Yanks particularly will find interesting Hugh’s description of the small multi-blade micro turbines that British companies, such as Marlec, AmpAir, and LVM have developed. We haven’t seen many of them yet in North America, but the durability of these rugged little machines and their low cost could offer an alternative to less robust domestic designs for off-the-grid users. There are increasing applications for these micro turbines in Europe where they have been used extensively in yachting but they are also now being found powering remote telephones and electric fences. Some of these micro turbines, such as the Marlec, use what Hugh calls “air gap” generators. Hugh explains how these mysterious little generators work, answering questions that I’ve had for years. Since I am in the process of erecting my own mini-wind turbine I found chapter 8 on towers especially useful, notably Hugh’s description of the TirFor hand-operated winch. TirFor is the brand name for a grip-hoist puller or winch. There are several other brands on the market but they all pull a steel cable through the body of the winch rather than wrapping the cable around a spool. They come in a range of capacities suitable for most small wind turbine applications. Best of all, they’re portable. You can carry one of these hand winches into areas where you would never get a truck or battery-operated winch. Hugh packs his TirFor with him for trips to service wind turbines at remote Youth Hostels and railway stations in Scotland. At one of these sites you literally have to walk over the mountain on a footpath to reach the hostel and anything that Hugh can’t carry gets left behind. If you have to buy any tool for your off-the-grid wind system, Hugh recommends buying the grip-hoist winch. I’ve seen these grip hoists used in Denmark and I was surprised at how easy they made raising and lowering a tower with a Whisper 1500 on top. As Hugh says a grip hoist is “hard to beat for erecting tilt-up towers, because it is slow and fail-safe.” Unlike using a truck or other vehicle to raise a tower, the operator of the winch has full control of the operation and there’s no dependence on hand signals and the risk of missed cues or lunging. For us here in North America there’s real value in reading a book about small wind turbines by a European. We are sometimes too insular and forget that there’s a big world out there. Europeans have different experiences, different wind turbines, and different ways of doing things, such as using hand-operated winches, that we can learn from. Books, such as Hugh’s, can open our eyes to new possibilities. Hugh writes in the simple, no-nonsense manner that I prefer. His illustrations are straightforward too, and he has introduced some original graphics. For example, I found his depiction of losses in a wind system both unique and informative. Windpower Workshop includes a comprehensive list of British consultants, dealers, and manufacturers of small wind turbines, a seven-page glossary, and a useful list of equations in the appendix. What sets these formulas apart from those in other books on wind energy is their presentation. Hugh helpfully provides them in a form suitable for keying into a spreadsheet so the reader can make their own calculations. Do-It-Yourselfers will greatly appreciate that gesture. Windpower Workshop, says Hugh, was “written for those who want to build their own windmill and for those who dream.” It’s books like this that keeps the dream alive. I have a 2KW 24v old aircraft dynamo , and would like to attempt a diy project to produce electric power (possibly to dump in my heating slave cylinder). On a hill @ bt702dz N. Ireland, with great wind speeds, as a retired elec/Eng. lecturer, I have time. Any advice?